When Cody arrived with us he had these deep cuts on his leg. After 2/3 days infection began to show. 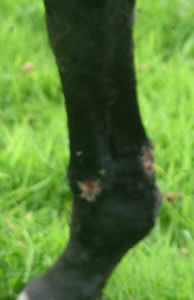 Straight away we decided to poultice the cuts & draw the infection out, as the heat & flies were not helping his healing. We started him on immune boosting herbs & 3/4 cloves of raw Garlic daily, to help fight the infection. This is a Herbal Poultice that I made to draw the infection out of the wound. 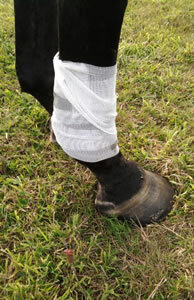 Poultice held on with bandage. 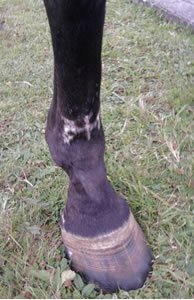 After Poulticing the wound for at least one week we left it off & the wound dried up & healed.